No-Bake Espresso (vegan) Cookies | Naturally. 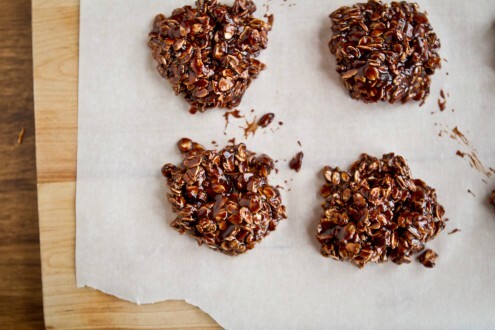 Growing up, no-bake cookies were secretly my favorite cookie. Anytime my family and I would go to a function (usually at church), I would hunt down the cookie platter and stock up on all the no-bake cookies. I loved those cookies and the only time I got them were when other people made them. For some reason, no-bake cookies never made an appearance at my house. I know… what a bunch of crap, right? 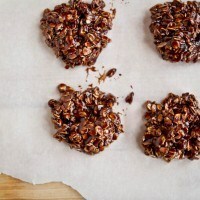 Recently I’ve noticed a trend in that I’ve seen a lot of no-bake cookies all over the blog world. They’ve been taunting me for weeks. Of course, they take like 10 minutes to whip together so really, I had no excuse not to make them. Except I was calculating how to make them just a little extra special. Then, out of left field, Kate (from Cookie and Kate) made them with Via from Starbucks and that friends was the very last straw. Kate’s idea of using espresso powder was perfect and with my new love of experimenting with coconut oil, I took these one step further and made them vegan. Really, these may look like a healthy snack but beware that 1) they still have tons of sugar and 2) they are addicting (really addicting…) A word of advice: use good ingredients- especially the cocoa powder. Good cocoa powder makes all the difference in the world! I may never turn on my oven again…. 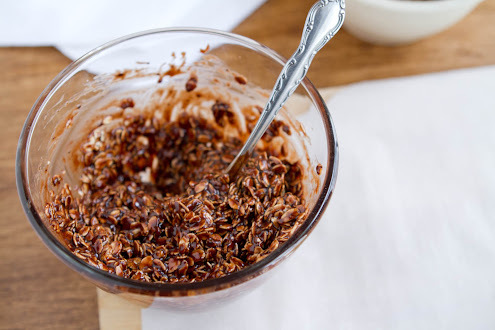 In a small sauce pan combine the first four ingredients and heat over medium-low heat until the peanut butter/coconut oil is melted and the mixture is hot (4-5 minutes.) Remove from heat and stir in vanilla. + While I call for rolled oats, these cookies come out quick a bit softer with using quick oats. Brilliant! You took those cookies to a whole new level! You’re absolutely right, I need to invest in some better cocoa powder. It’s time to chuck that old carton of Hershey’s leftover from my college days! What’s your favorite brand? I usually go out of the bulk bin at my small natural foods store or I’ve also become fond of the Equal Exchange baking cocoa! Haha, well, at least you made it healthier! It looks amazing…I’m totally haunted by sweet tasting recipes too, lol. I love sweet things! Which can be bad when you’re a health blogger! These look so awesome. I’ve actually been looking for a no-bake cookie recipe because I want to do some cooking with my class (I’m a 4th grade teacher). And obviously we don’t have an oven, so no-bake is perfect! Other than the espresso flavor… these would be wildly popular with my fourth graders! Maybe I’ll tweak the recipe and make it more kid friendly (and keep the original recipe for myself!). 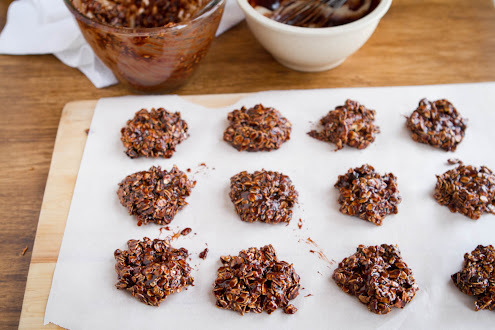 I love no bake cookies, and especially how these have espresso powder! May need to make these tommorow! Just made these! I substituted vegetable oil for coconut oil and soy milk for the almond milk. They are so easy and delicious! I searched all over for a vegetarian raw oatmeal cookie and this is by far the BEST COOKIE I’VE EVER EATEN! Thanks! I am going to make these a staple in our sweet tooth section of the kitchen. this was brilliant– adding the chocolate powdered greens. brills. question why did you use choc chips instead of cocao powder? I made mine with stevia bakin sugar too and they were great. I made these tonight for an event tomorrow. I ended up having to make an extra batch because I had a few…few being enough to need to make another batch…whoops! I only had the Mocha and Cinnamon swirl varieties of Via and it worked perfectly! I made these on Friday night. I haven’t had a no bake cookie since I was a kid and I have never made them myself. I didn’t have espresso powder. I also decided to try using 1/2 natural peanut butter and 1/2 Nutella (1/8 cup of each). What I didn’t realize was that the cookies would take several hours to set. I was thinking I would be eating cookies in 30 min or so. When I went to bed, my cookies were still falling apart, I thought they were ruined. However, when I woke up, they were PERFECT! I had three for breakfast! They are very tasty. I like mine chilled so I keep them in the refrigerator. ENJOY! I should probably add that into the instructions 🙂 I usually eat it right out of the bowl but they are fantastic the next day! I made these tonight to go on an assorted cookie platter for Vacation Bible School refreshments. I tweaked the recipe a bit by using almond butter instead of peanut butter and I added shredded coconut. 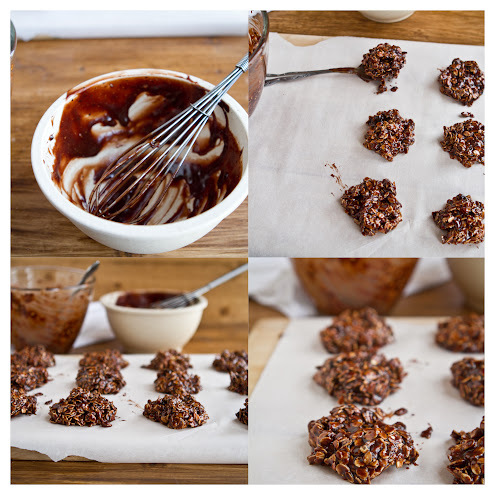 I must admit that I’ve never been a big fan of no-bake cookies…I just didn’t like the way they looked. Though these cookies would never win a beauty pageant, they were some of the best cookies I’ve ever eaten! And, believe me, I’ve eaten plenty of cookies in my lifetime. This recipe is definitely a keeper!